Bone grafting has many uses in the field of restorative dentistry. Most often, the procedure is used to help patients qualify for dental implants or to preserve a tooth socket after an extraction. Unlike many other dentists, Dr. Jon Marc Van Slate will personally plan and perform your bone grafting procedure. In addition, our Houston, TX, practice is equipped with state-of-the-art technology that enables us to achieve optimal results. To schedule a bone grafting consultation and learn more, contact our practice today. Bone grafting, or bone augmentation, is used to build up the density and mass of bone tissue. The actual graft can be taken from your body or the body of a donor, or it can be made from a synthetic material. Before undergoing a bone grafting procedure, Dr. Van Slate will review your medical history and ensure that any current medications will not interfere with your safety. Most patients only require local anesthesia during bone grafting. However, we also offer oral-conscious sedation for those who are particularly nervous about their procedure. Since smoking can interfere with healing, patients will need to refrain from tobacco use leading up to and following treatment. 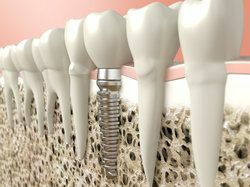 Dental implants are widely considered to be the best treatment for patients with missing teeth. Unfortunately, the jawbone will naturally begin to recede after tooth loss, so many candidates will find that their jaws are not dense enough to support dental implants. In these cases, bone grafting may be able to restore bone volume so that patients can qualify. With bone grafting, we can help to ensure that you experience optimal results after a tooth extraction or dental implants treatment. We will evaluate your candidacy for dental implants with the help of cone beam scans, which will create a detailed 3-D image of your jaw. If Dr. Van Slate determines that your jaw is too weak for implants placement, he will discuss your goals and review the benefits of bone grafting to determine if this preparatory treatment is right for you. On the day of your procedure, we will numb the area to ensure your comfort. Next, Dr. Van Slate will carefully place the grafting material into weakened areas of your jaw, and he may secure it in place with small screws. Over the next several months, the graft will encourage new, healthy bone growth. Patients who are undergoing tooth extraction may also benefit from bone grafting. After removing a tooth, Dr. Van Slate will place grafting material into the remaining socket to help prevent the loss of bone tissue. Without this treatment, a large percentage of bone volume may be lost after an extraction, which can leave the socket misshapen and the bone weak. We will discuss the full benefits of socket preservation during your tooth extraction consultation. Dr. Van Slate and his team are dedicated to providing patients with the best-possible care. With bone grafting, we can help to ensure that you experience optimal results after a tooth extraction or dental implants treatment. To learn more about why bone grafting is performed, schedule an appointment today.